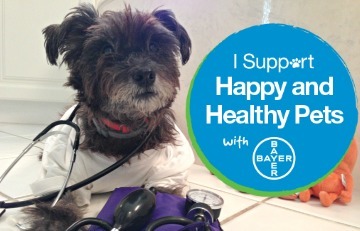 Did everyone have a wonderful holiday? We love celebrating the holidays and receive great joy from giving gifts and spending quality time with family and friends. 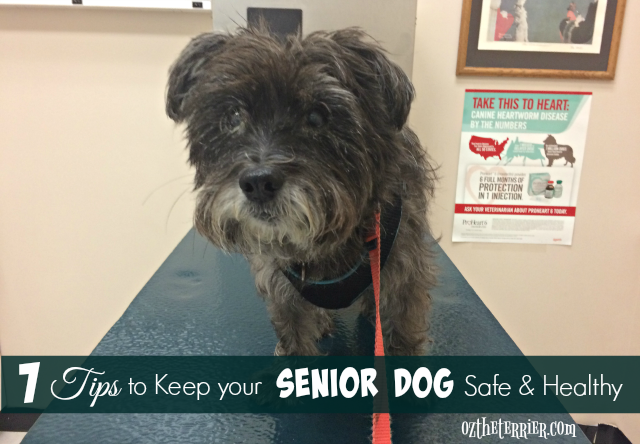 Oz joins us in almost all of our holiday celebrations and adventures, which makes our Holiday Everyday Awesome. 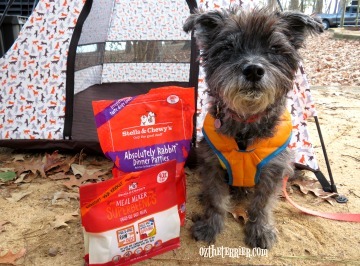 Stella and Chewy’s is an Oz the Terrier sponsor. 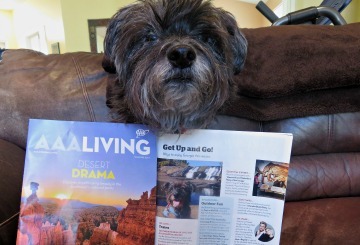 We are being compensated for spreading the word about Stella and Chewy’s products but Oz the Terrier only shares information we feel is relevant to our readers. Oz has his own ways of making our holidays extra special. 1. Oz is the Gift that keeps on Giving. Oz joined our family in 2004 on the Thanksgiving weekend. He was our early Christmas gift to each other. From that first holiday season, Oz has loved Christmas. 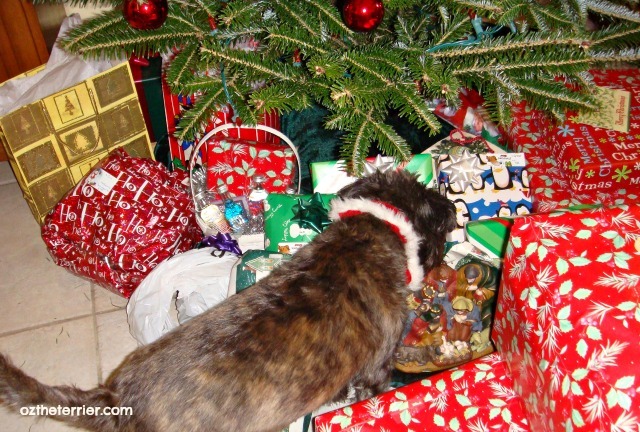 He cannot wait to pull gifts out from under the tree and begin unwrapping. 2. Oz keeps the Holiday Fun(ny). From burying his chew toys under the Christmas tree to strutting around in his Reindeer Santa Hat, Oz knows how to give everyone a good holiday chuckle. 3. 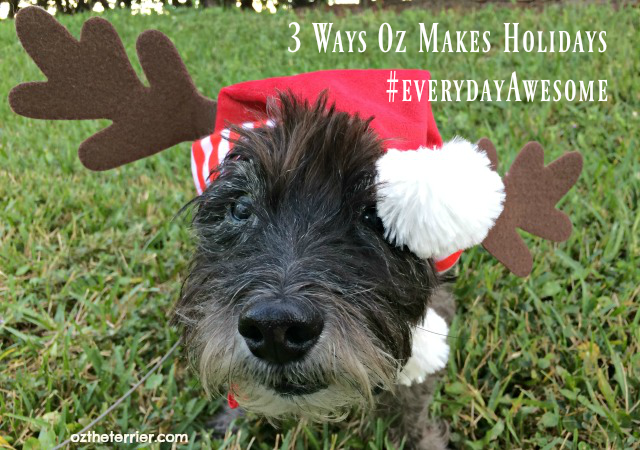 Oz makes the Holidays an Everyday Awesome Adventure. If you have followed us for some time, then you know the New Year’s holiday weekend is always our first camping trip of the New Year. 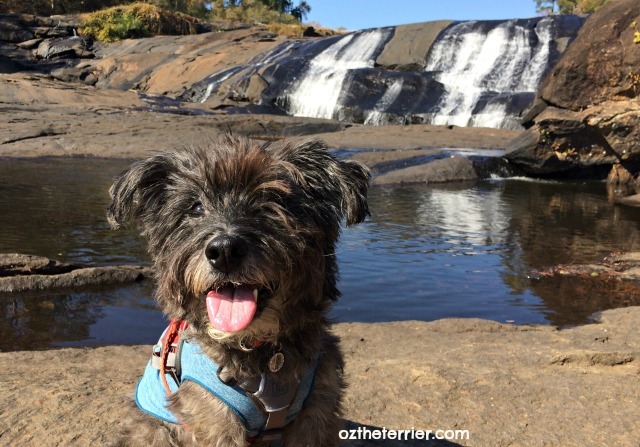 Oz makes every camping trip an Everyday Awesome Adventure because he truly loves being outdoors with us. 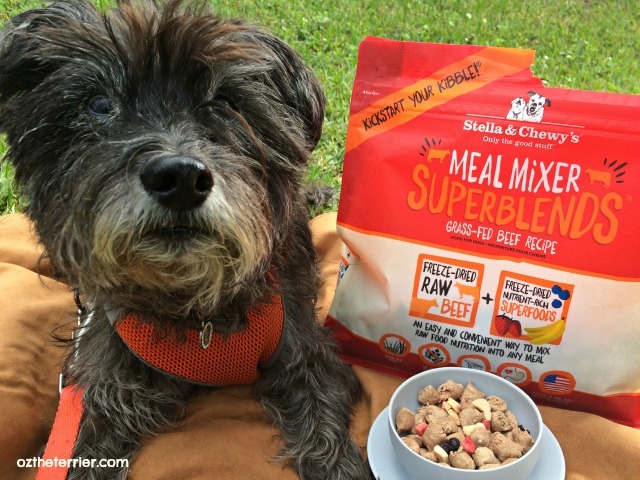 Oz gets fueled up for our Everyday Awesome outdoor adventures with Stella & Chewy’s awesome raw nutrition for dogs including Stella & Chewy’s Dog Dinners, Meal Mixers and new Meal Mixers Superblends. 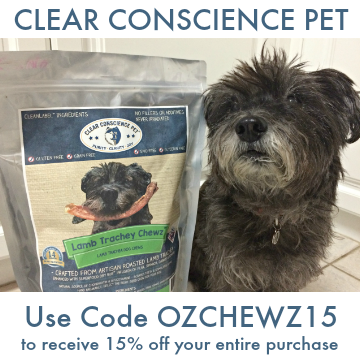 With raw-minimally processed pure proteins, organic fruits and vegetables, Stella & Chewy’s offers everything Oz needs as a senior dog to thrive and maintain his active lifestyle. 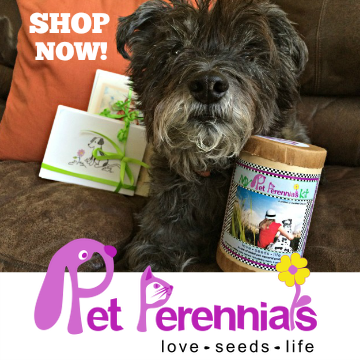 Oz makes holidays, and every day, Everyday Awesome for us with his adventurous and fun personality so it is only right we make every day and every meal Awesome for him. and every Day, Everyday Awesome for you? We ❤︎ Stella & Chewy's kibble toppers! Yum-may. Warm wishes for a happy 2017. Aw how cute, Oz! Hope you had a lovely Christmas. Shiner has a blast opening her gifts too. You are a wonderful addition to your family and to Blogville! I also have to say Stella & Chewy's is super tasty stuff! You are crushing it in your Christmas hat, O. Have fun on your opening camping trip of the new year! I make Mom smile because I run everywhere in the house. Walking is for humans - I am too busy for that. 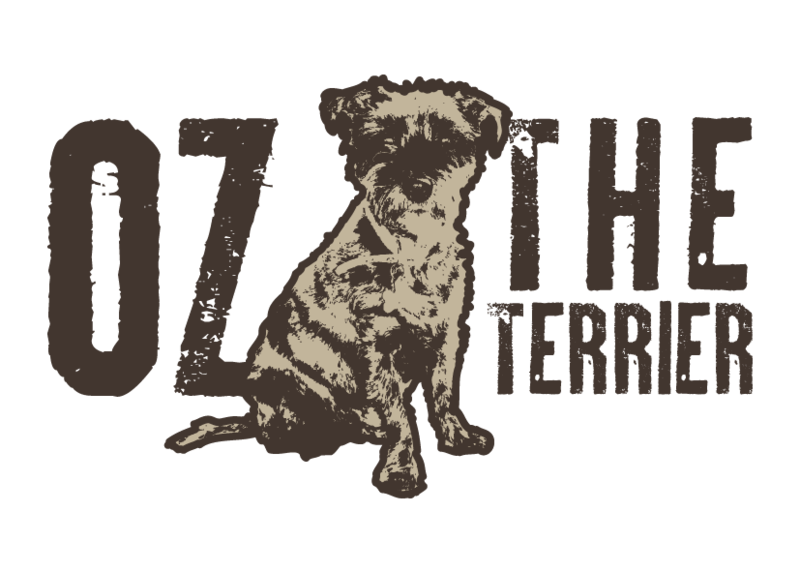 You are a delightful dog, Oz! Oz, you are so darn cute and the smiles must never end around the holidays there! Our crew does the same for me...their antics always keep me smiling. Enjoy your camping and Happy New Year!